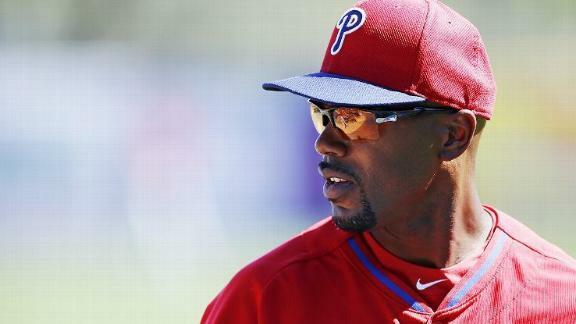 As Philadelphia Phillies shortstop Jimmy Rollins closes in on the franchise's record for career hits, the man he's about to pass says Rollins is building a progressively stronger case for Hall of Fame consideration. Hall of Famer Mike Schmidt, who holds the Phillies' career record with 2,234 hits, said he expects Rollins to continue playing at a productive level for three or four more seasons. Rollins recently passed Richie Ashburn to move into second place on the Phillies' hits list. He enters Tuesday night's game at Washington with 2,225 hits -- nine fewer than Schmidt. "My assessment would be that if Barry Larkin is in the Hall of Fame, you've got to think about Jimmy Rollins," said Schmidt, a part-time member of the Phillies' broadcast team. "The importance for him is to finish out strong the next three to four years and continue to be a force. "I can't see Jimmy Rollins as a bench player or a DH. I can't see him sort of tailing off or hanging around. I see him being an offensive force and a great defensive player for the rest of his career. If you add that to where he is now, he's going to get some consideration for the Hall of Fame." Rollins, 35, is a three-time All-Star and four-time Gold Glove Award winner over 14 seasons in Philadelphia. He won the National League's MVP Award in 2007 and has one Silver Slugger Award at shortstop. Larkin, currently an analyst for ESPN, made it to Cooperstown in 2012 on his third attempt with 86.4 percent of the vote. He made 12 All-Star teams, won nine Silver Sluggers and three Gold Gloves in his career and captured an NL MVP with Cincinnati in 1995. Rollins already leads Larkin in home runs (205 to 198), doubles (464 to 441), triples (109 to 76) and stolen bases (432 to 379). But Larkin's OPS is significantly higher than Rollins' (.815 to .753). According to Baseball-reference.com, Larkin ranks 97th in baseball history with a career wins above replacement of 70.2. Rollins is tied for 414th with a WAR of 43.1. One of Rollins' biggest obstacles to Hall of Fame consideration will be his .328 career on-base percentage. Schmidt said Rollins' focus on hitting with power might have hurt his production in other areas. "I don't want to disrespect him when I say this, but Jimmy may swing for the home run a little too often, and I think that's dragged his batting average down," Schmidt said. "I believe Jimmy could have been a Tony Gwynn-kind of a hitter. "Jimmy can hit one 400 feet -- he really can. Knowing that, over time, he'll probably look back when he gets done with his career and say, 'I wish I had never hit a home run.' He probably would have had well over a .300 career batting average, but the influence of wanting to juice the ball and put it in the air too often and maybe not on a line enough dragged his batting average down. But still, he's very productive." Rollins is hitting only .251 this season but has a career-best .352 OBP through 52 games. He's in the final year of a guaranteed three-year, $33 million contract and needs only 203 more plate appearances in Philadelphia's final 107 games for an $11 million option to vest for 2015. He has consistently said he has no interest in waiving his 10-and-5 service-time rights and consenting to a trade, but Phillies general manager Ruben Amaro might have an incentive to explore the market again now that Philadelphia is 24-31 and last in the NL East. Schmidt said he'll be pulling for Rollins and plans to be on hand to congratulate the shortstop when he collects his 2,235th hit. "It's one of those records where a guy has to play for a long time in a city," Schmidt said. "If you asked me 10 years ago if that record would ever be broken, I probably would have said no, because these guys move around too much now. "This is a tough city, and most guys don't do it. That's a credit to Jimmy to have survived this town. There's a long list of guys who couldn't, and didn't, in all sports." Jerry Crasnick discusses comments made by Hall of Famer Mike Schmidt indicating that Phillies SS Jimmy Rollins' career is on a Hall of Fame trajectory.